The Withings Go is exactly what the company wanted it to be: fun, accessible and easy-to-use. For those that want a cheap, cheerful, glorified pedometer with a few extra features, the Go is a great choice. For those after an actual activity tracker, there are better options if you can afford to spend a little extra. French company Withings has been central to the activity tracking and health markets for some time. It might not be as well known as the likes of Fitbit, but it has produced some winning devices in the past. Buy into the Withings platform and your options are plentiful: from activity trackers and smart scales to blood pressure monitors and smart cameras - there's a whole network of devices. The latest in the company's portfolio is the Go activity tracker, designed to be fun, easy-to-use and affordable. At £50 it's no surprise it's basic, with a black-and-white E Ink display and a plasticky finish. Does such simplicity stand in the way of it being a desirable entry-level tracker for walking, running, swimming and sleep tracking, or is it a worthy addition to the portfolio? The circular pebble-shaped device can be worn pretty much any way you choose, whether that be on the wrist, placed in a pocket, or attached to your belt. It's versatile and even water-resistant, which are among its biggest attributes. The always-on E Ink screen - which is the same technology as used in many Amazon Kindle e-readers - shows step progress first and foremost, but a hard push on the display briefly presents a clock face. When the user-defined step goal is reached, the virtual "walking man" displayed in the centre changes to a star and the progress lines around it reset. While E Ink might not look as snazzy as full colour display options, it is visible in all conditions, its avoidance of reflective sunlight being one of its obvious benefits. On the rear of the Go there is a small indent for accessing the battery, which should last for eight month stints at a time. That's another of the Go's best attributes, along with its waterproof rating of up to 50-metres. The Withings Go doesn't have a ground-breaking design by any means, nor does it look particularly great on the wrist. But it is easy to use, comfortable and it doesn't need to be seen to be heard. The Withings Go will track walking, running, swimming and sleep. Step tracking is its biggest focus, given this is what is seen on the E Ink display, but information for other activity can be found in the accompanying Health Mate app. In terms of walking and running, the Go will record steps taken, distance travelled, time and calories burned. When it comes to swimming, there are no specific swimming metrics recorded, it's simply a case of calories burned and time. Sleep tracking offers duration of sleep, time awake, time in light sleep and time in deep sleep. It will also record how many times you woke up and how many minutes it took you to fall asleep. If you can bear to wear the device in bed anyway. The Go is all about basic activity tracking, which is reflected in its price. There are no fancy features like smart notifications, GPS tracking, elevation data or heart-rate monitoring. 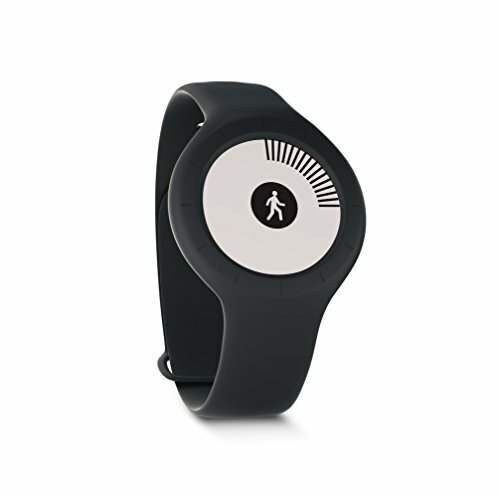 We found the Withings Go to slightly underestimate in terms of step tracking, which is what we have found from previous Withings devices. We tested it alongside the Fitbit Charge HR and Fitbit Alta on the Moon Walk, which is a walking marathon. In our experience, the Fitbit Charge HR has been accurate almost to the step - so it's a good indicator to how other devices perform. The Withings Go measured 46,977 steps for the duration of the walk after midnight, whereas the Fitbit Charge HR measured 47,922, and the Alta 49,255. It's not a huge discrepancy across such a long distance - but a discrepancy nonetheless. Distance was more accurate on the Withings Go than the Fitbit devices - but still not accurate enough. The Go measured 23.45 miles for the 26.2 mile distance, while the Alta measured just 22.73 miles (we had to take the information from the hour before midnight too, which is why the screenshots above show different data). Calories burned is a little harder to determine in accuracy terms, especially without heart-rate monitoring, elevation or body metrics data. The Go measured 3,569 calories burned, compared to the 3,252 from the Fitbit Charge HR, which has both heart-rate and elevation measuring capabilities. We wouldn't take either as gospel, but the Go hasn't done badly in terms of estimation given it lacks two fundamental data points. As we've said in previous activity tracking reviews, we're not a huge fan of sleep tracking because it's not the most comfortable, nor particularly reliable. But the Withings Go has it as a feature if you want to use it. And it's nicer than some trackers in that its E Ink display doesn't wake you up in the middle of the night by shining in your face. We measured the Withings Go against the Withings Aura Sleep System and the results were quite different. Where the Aura measured 6 hours 41 minutes in bed, of which 6 hours and 7 minutes were asleep, the Go measured 7 hours 38 minutes in bed, of which 7 hours 21 minutes were asleep. In this case, the Aura was the more accurate as we were reading for the extra time the Go suggested we were sleeping. The Aura also registered us waking up four times, compared to the Go registering two times, the former of which was correct. The Aura provides more detail, while the Go provides a rough estimate. The free-to-download Withings Health Mate app - used in conjunction with the Go and other Withings devices - offers a good, clean interface. However, it's not quite as simple or effective as the Fitbit app. Rather than having tabs at the bottom like Fitbit, the Health Mate app has a main home page with a menu in the top left, offering access to various sections, such as user profiles, leaderboard and a dashboard with movable widgets. This is also where settings are, should you want to change units or language, for example. There are far fewer options to fiddle with for the Withings Go than there are with Fitbit. For example, it's not possible to tell Health Mate which wrist the Go is on or detail measurements like stride length for more accurate readings. It is possible to tell the app you've forgotten your Go, however, which is something you can't do on Fitbit. On the Health Mate app's main page there's a colour-coded block sat at the top, which Withings calls Timeline. A swipe left or right on this block will display various metrics, such as activity (orange), weight (pink) and nutrition (purple), as derived from the Go and any other Withings devices you may have connected, like the Body Cardio scales. A tap on each specific metric will display more details, including a graph, and allows you to view your history. It's also possible to change goals and targets when within a specific metric by tapping on the three option dots in the top right corner. The Withings Go is one of the cheapest activity trackers out there, sitting in line with the likes of the Misfit Flash. Although the Go's E Ink display couldn't be called pretty, it is functional for showing step progress and, therefore, might be the preferable choice. The biggest problem the Go faces is that there isn't a huge price difference between the budget and higher-end of the activity tracking market. So an extra £50 could get you a better looking tracker with a colour OLED display, even better app experience and smart notifications. For those who want what's essentially a glorified pedometer with a few extra features, the Go is a great choice. For those after a proper activity tracker, there are better options if you can afford to spend a little extra.